Terra Forming Terra: Heart Disease Vaccine? It appears that heart disease will turn out to be an autoimmune system failure that misidentifies a a ordinary protein as foreign. Thus the idea that it can be treated with vaccine is creditable. This also explains why my little experiment that I conducted for three years applying tetracycline appeared to reduce low level inflammation. It also suggests that allergies may be linked to all this. Thus we possibly have a new strategy that will be jumped on pretty quickly that may also resolve allergies. This is very good news as there are no convincing protocols out there to prevent the disease at all. Most recommendations are thinly disguised efforts to blame the patient. ScienceDaily (Aug. 14, 2012) — Most people probably know that heart disease remains the nation's No. 1 killer. 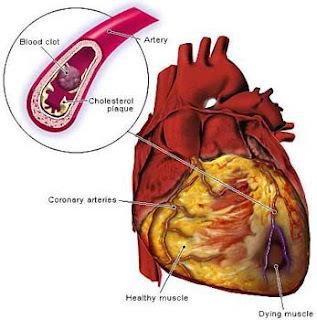 But what many may be surprised to learn is that cholesterol has a major accomplice in causing dangerous arterial plaque buildup that can trigger a heart attack. The culprit? Inflammatory cells produced by the immune system. A number of research studies have demonstrated inflammation's role in fueling plaque buildup, also known as atherosclerosis, which is the underlying cause of most heart attacks and strokes, but knowledge of which immune cells are key to this process has been limited -- until now. Researchers at the La Jolla Institute for Allergy & Immunology have identified the specific type of immune cells (CD4 T cells) that orchestrate the inflammatory attack on the artery wall. Further, the researchers discovered that these immune cells behave as if they have previously seen the antigen that causes them to launch the attack. "The thing that excites me most about this finding is that these immune cells appear to have 'memory' of the molecule brought forth by the antigen-presenting cells," said Klaus Ley, M.D., an expert in vascular immunology, who led the study in mouse models. "Immune memory is the underlying basis of successful vaccines. This means that conceptually it becomes possible to consider the development of a vaccine for heart disease." Dr. Ley said he believes the antigen involved is actually a normal protein that the body mistakes as being foreign and therefore launches an immune attack resulting in inflammation in the arteries. "Essentially, we're saying that there appears to be a strong autoimmune component in heart disease," he said, explaining that autoimmune diseases result from the body's mistaken attack on normal cells. "Consequently, we could explore creating a "tolerogenic" vaccine, such as those now being explored in diabetes, which could induce tolerance by the body of this self-protein to stop the inflammatory attack." The study was published online August 13 in the Journal of Clinical Investigation. Dr. Ley cautions that creating a vaccine is a complex process that could take years to develop. However it offers exciting potential. "If successful, a tolerogenic vaccine could stop the inflammation component of heart disease," he said. "This could probably be used in conjunction with the statins (cholesterol-lowering drugs) that have already taken a significant chunk out of the numbers of people with heart disease. Together, they could deliver a nice one-two punch that could be important in further reducing heart disease." Dr. Ley said antigen-presenting cells take up infectious organisms, foreign materials and self-proteins (in the case of autoimmune diseases) and "chop them into little pieces called epitopes" and then display the pieces on the surface of the cell. "The T cell comes along, and if it has the correct receptors, it will recognize the epitope pieces and make cytokines (a type of immune system soldier molecule) that attack the material and cause inflammation." Autoimmune diseases include such illnesses as type 1 diabetes, rheumatoid arthritis and multiple sclerosis. In the study, Dr. Ley and his team used live cell imaging techniques to track immune cells in normal and artherosclerotic mouse aortas. He said in mice with atherosclerosis, there are a large number of antigen-experienced T cells that have already seen certain epitope pieces (from self proteins) that they perceive as foreign. "The T cells talk to the antigen-presenting cells and, in response, make cytokines that launch an attack. This is what makes the inflammation in the vessel wall persistent." Inflammatory cells join fat and cholesterol to form artery-clogging plaque that can eventually block blood flow, leading to a heart attack. "It wasn't previously known that antigen-experienced T cells existed in the vessel wall," said Dr. Ley. "This experiment makes me now believe that it may be possible to build a vaccine for heart disease."